Fire Alarm Design, Installation,Commissioning, Certification & Maintenance. Our design criteria always follows the scope of I.S. 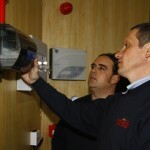 3218: 2009 Fire detection and Fire Alarm Systems for Buildings – System Design, Installation, Servicing and Maintenance. Our design engineers are equipped with the most modern facilities available on the market to carry out design for all small, medium and large scale projects. 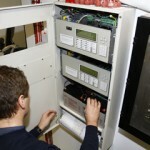 Horizon also have their own specific team of electricians who deal with the installation of the fire alarm systems. The installation may be for a new or existing premises. There is a large number of techniques now available for the retro fitting of fire alarm systems and therefore no complications with installation. Upon final completion of the installation of the fire alarm system, one of our service engineers will attend site to commission the fire alarm system. This is a process involving the positioning of all the devices to the bases which will have been fixed in position during installation. All of the respective devices will have been previously addressed so that once the fire alarm panel sees the device it will receive that address. This address can in turn be given a name to correspond with the area of the building in which the device is located. Following the device upload the sounder system must be checked to ensure the correct level of db’s. A certificate of commission will be issued on completion of the project, this will indicate the system type and areas for which the system in question is relevant to. In addition, should there be any variations, then these will be indicated on an attachment to the commissioning certificate. The Fire Services Acts 1981 & 2003, Fire Precautions (workplace) 1997, and Regulatory Reform (fire safety) 2005 place a legal responsibility on all employers to achieve an appropriate standard of fire safety. The “responsible person” is the person/s who owns or controls the business and/or the owner of the property in the case of multi-occupied buildings and it is their responsibility to ensure that a regular Fire Safety Audit is carried out. In order to ensure compliance with the Fire Services Acts 1981 & 2003, the fire safety within an organisation should be assessed in accordance with fire safety guidance documents and codes of practice. This assessment could take the form of a Fire Safety Audit, which focuses on whether compliance is achieved with reference to these standards, or not. On completion of the Audit, you will be presented with a Fire Safety Audit Report outlining the deficiencies in the premises with reference to the Fire Services Act 1981 & 2003. This report will also include an action plan for implementation in order to ensure compliance with fire safety legislation, guidance and best practice. For any purpose involving the provision of, sleeping accommodation, excluding dwelling houses. Use as, or part of, an institution providing treatment or care. Use for purposes of entertainment, recreation or instruction or for the purpose of any club, society or association. Use of any other prescribed purpose. If you don’t employ anyone who is competent to carry out a Fire Safety Audit, then call us. We have years of experience with Fire Safety both active and passive and have carried out Fire Safety Audits in all types of industries, both large, multi scale and small. Should you require our services, we can accommodate your requirements both quickly and efficiently allowing you to concentrate on running you business with confidence!